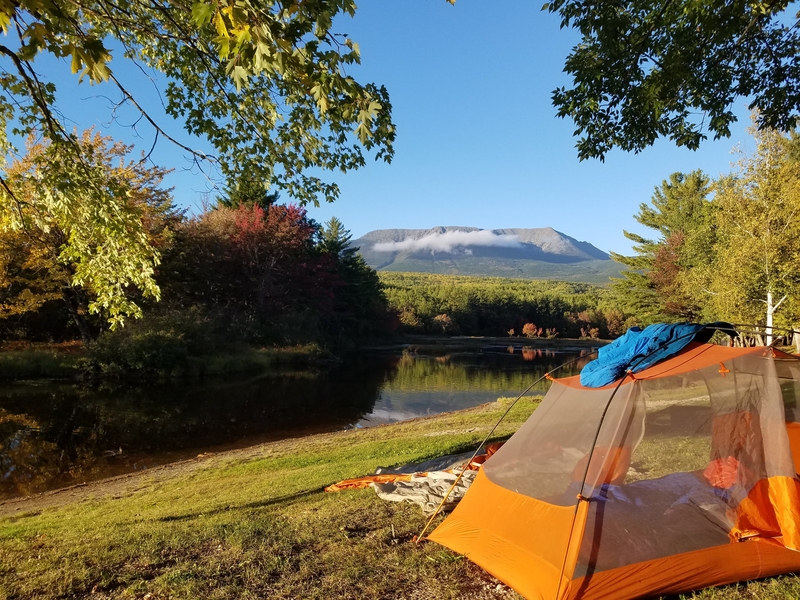 Last night sleeping in the tent(Copper Spur UL2 HV), with Mount Katahdin in the backdrop. Copper Spur UL2 HV – Best tent ever. Roomy as heck, and still light as a feather. Can fit three smelly hikers comfortably. More if needed. Big, big fan. Patagonia Nano Puff Air Hoodie – I still wear this as an everyday jacket, which I did not expect coming back to Midwest winters. Couple holes, easily fixed with some Tenacious Tape, still going strong. MSR Titan Tea Kettle – Huge fan of this pot. Perfect size at just around 3.5 cups, sturdy on top of many stoves. GSI Outdoors Ultralight Java Drip Coffee Maker – This! This piece of gear was an absolute game changer. It was gifted to me by Happy Feet, who was gifted it by the wonderful Yelp. I was never much of a coffee connoisseur, but after traveling with Ms. Feet for a thousand miles, I became quite the fan. Crocs and flip flops tore up multiple dance floors, that night in Gatlinburg particularly. Shout-out to Puckers. I could honestly write a whole post about the importance of having another pair of footwear when hiking, and I just might. 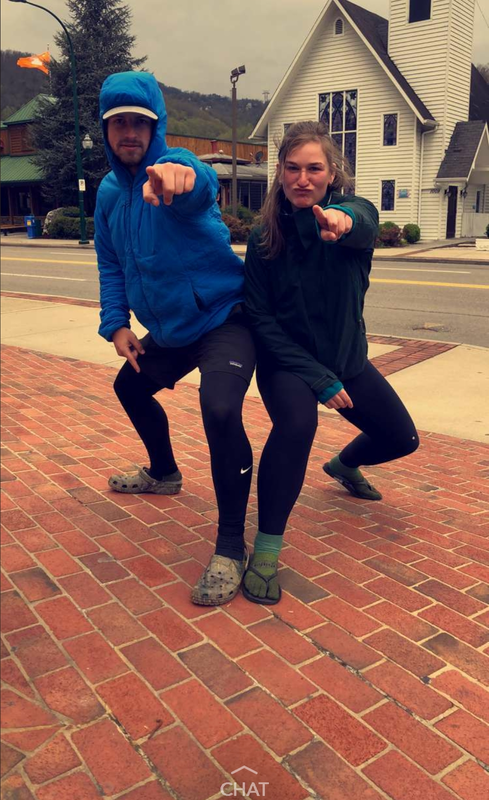 I rocked some camo Crocs and I’ll tell you what, they put on just as many miles as my boots and trail runners (five pairs). These came in handy on so many occasions. Whether it be in town, camp, rivers, bars, dance floors, getting your feet out of your footwear and into something stable is important. OK, I might actually have to write a Croc blog now. I had wrote a previous blog post before^ I left for my trek about making your own tent footprint out of Tyvek to help save some money. This ended up working super well. The Tyvek held through the snow, rocks, roots, rain, and mud for 2,190.9 miles, protecting the base of my tent. After all that, I don’t absolutely need a new one, but I have a few ideas on how to improve the use of Tyvek as a ground tarp. And with how easy it was the first go round, why not. 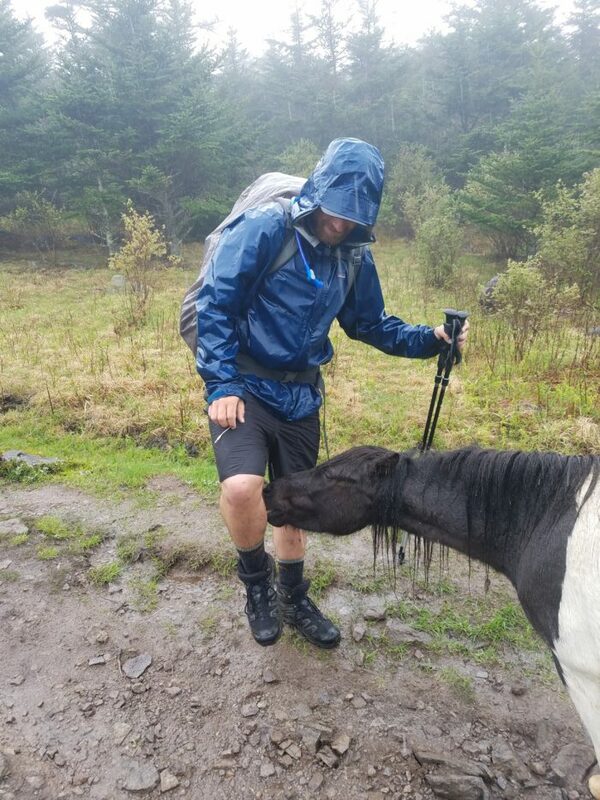 Rain jacket – I used the Patagonia Torentshell, and it wasn’t my absolute favorite to hike in. My challenge with rainshells is the breathability provided, releasing moisture from within while also keeping the downpour out. This one just did not work for me because I sweat a lot. I used it a bit at the start, and then a lot toward the end as we were walking into fall up in Maine. Though it kept me warm rather than dry, I’d say. Grayson Highlands ponies using me as a salt lick. If I was to do it again (once again, wishful thinking), I would start with a rain jacket, and as the summer months approach I would make the switch to a lightweight poncho. Then switch back to carrying a rain jacket up in the northeast. You don’t want to risk being up on Mount Washington in a poncho. Headlamp – Important piece of gear that I did not use as often as I thought. I did not do a lot of night hiking, so maybe that’s why. But my light failed me a few times unfortunately, and I was almost without one in Maine if it wasn’t for Charms thankfully having a spare. From now on I’ll be sure to have a quality headlamp. Boots – Pre-trail I was 100% on rocking the boots the whole way. I even bought an extra pair to send to myself, having broke them in ahead of time. But once I made the switch to trail runners, I could not have been happier. Socks – Three pairs is too many, two pairs is not enough. I had many issues with socks. At one point I was down to a pair and a half, which is what makes me hesitant to take only two pairs out with you. I dunno. You do you. Darn Toughs, though. A good spork goes a long way. Don’t rock up to to Pine Grove Furnace General store and have to buy a plastic spoon to eat your ice cream like I did. Half-gallon challenge! The girls said screw the spoons. I switched packs in Massachusetts. It was kind of a treat-yo-self moment for me after I was laid up at a medical clinic thinking that I had Lyme and my trek was coming to an abrupt end. I loved my Deuter ACT Lite 65+10, but it was definitely more than I needed. I switched to am Osprey Exo 48 and had my base weight sub 24 pounds in Maine. Took me long enough. Be mindful of plastic bags, whether you like Ziploc, Hefty, or whatever brand. A good plastic bag goes a long way. Started with a 3L water reservoir. Really enjoyed using it and thought the convenience was worth the added weight. Did not finish with it due to the unfortunate champagne/strawberries soaking attempt. Happens. I finished the trail carrying the PowerCore 10000, which was pretty solid as far as size, weight, and number of charges go. It was not long into my hike that I traded in my awesome zip off pants for a pair of shorts (Patagonia Baggies). Once I did this, I began to carry an additional pair of leggings to wear underneath and keep the other pair dry at all times for colder sleeping nights. When it comes to water purification, I’d go with simplicity. When you get to a source, all you want to do is filter and drink it. I have interesting opinions when it comes to sleeping pads and sleeping bags. I am a husky-sized fella and they don’t make husky sizes for hiking. Yet. 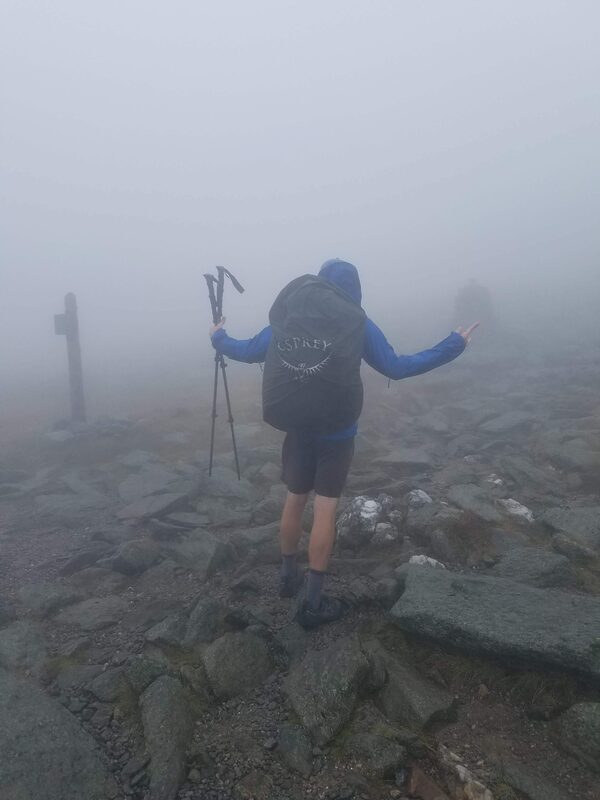 Good Wood leading the charge up Mount Washington in some gnarly weather. **The items I have listed are at their current prices. I definitely did not pay these prices for gear. I was constantly and still am always looking for the best gear deals out there. 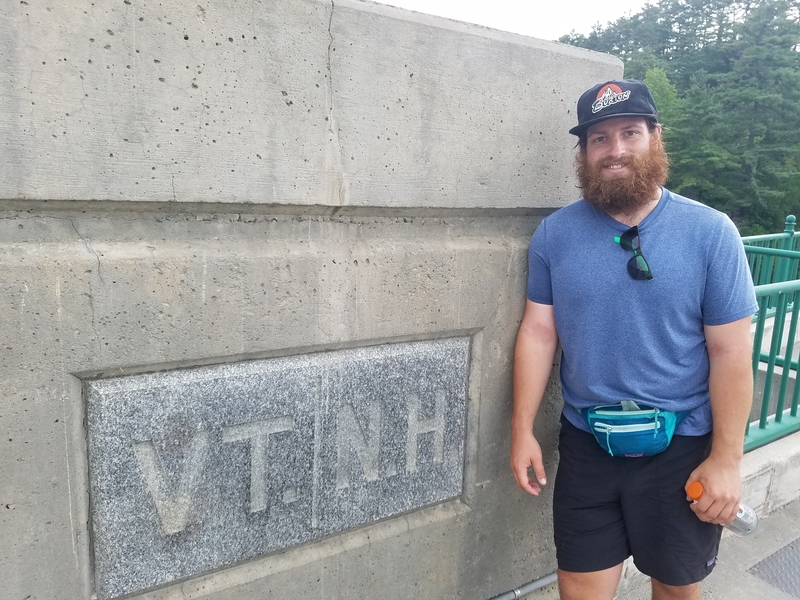 Patagonia fanny pack that Toasty let me borrow on our hike into Hanover. Sorry I got it so sweaty. Obviously, this is all my opinion based on my experiences and what worked for me. I remember doing loads of gear research, and I hope this can give those of you with multiple tabs and windows open searching a little help with the decision-making process. Sticks! It’s me Toasty! Great article, love the shout out to Miss Feet and Charms! Miss your huskyness! Hope all is well! 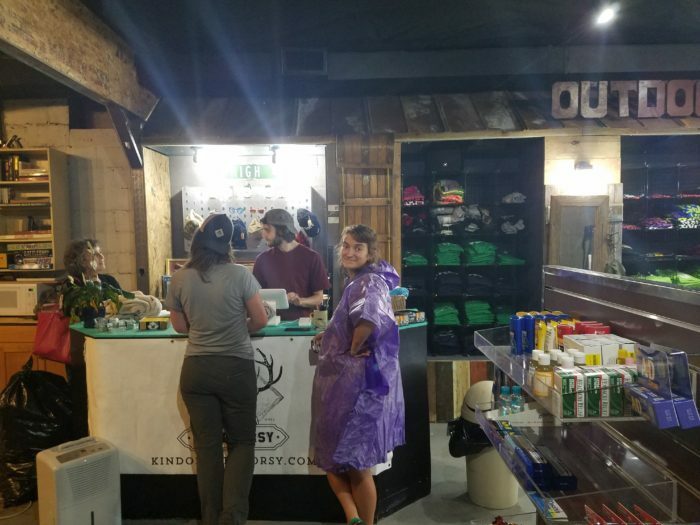 The truth is, rain gear doesn’t work. None of it, whether it’s a $700 Arcteryx jacket or a $25 Frogg Toggs jacket (though in my experience on the AT, the Frogg Toggs actually worked better than anything else). 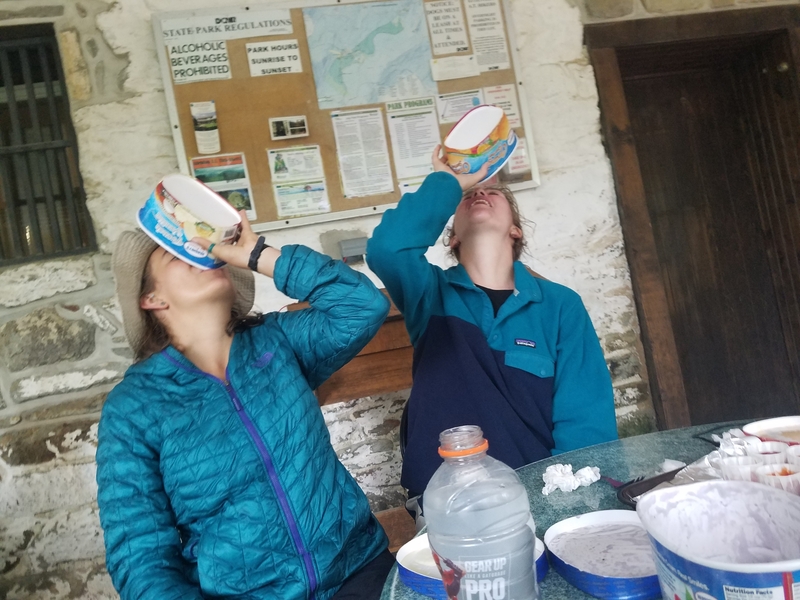 And because of the reason you cite: If you sweat — and let’s face it, it’s hard not to sweat on the dadgum-climb-every-steep-mountain-we-can-find-AT — you’re going to be wet pretty soon. I suppose if you were strolling along the beach your rain jacket might work for an hour or so, but…. Basically, on the AT (’16) I just learned to be wet. That was a drag when it was cold rain, but in the warmer months, I didn’t even bother putting my rain jacket on. Just walked through the rain, then dried when the sun came out! Love them Grayson Highland ponies!